In less than one week, it will have been 6 months since Rui”s mother, Machico Terauchi, kidnapped my son and took him out of the country under the pretense of a short trip. Machico had flown back and forth to Japan so many times for her fashion business masters, Japan’s United Arrows, Isetan, Joi’x Corporation, or towing another of her employers, American fashion bongo Steven Alan, that it had nearly become routine. Each time she took Rui there I protested for her to shorten the trip; but Machico was tone deaf to appeals from me. She schemed and imposed her will on Rui and me with flashes of sharp anger and denunciation. Today’s been a bad day, like every day since this has happened. No language can express the angst, frustration, impotent desire for action, and deep mourning of Rui’s presence that weighs on me, or how useless daily life feels after such a betrayal. What should I do? Tear my shirt. Burn our photos. Stop the clocks and sit like Buddha. Go out and weep on a train. He is my true love. He’s only five. I don’t know how significant this would be to anyone, but amid the endless stream of unanswered calls to Machico’s telephone in Japan, where I repeat to an answering service robot that I want to see and talk to my son, my wife answered the phone last weekend on December 4th. It might have been accident. I suppose it could have been a strategic move on her part to simulate deniability, but that’s unknown to me. I could hear Rui’s voice in the background, playing. Little boy’s voice, sweet voice I haven’t heard since June. Voice I love. My heart dropped 80 stories in a blink. It took a moment for me to begin to speak, but once I regained my voice, I shouted at her to put my son on the phone. She was well-rehearsed. “You want to speak to Rui?” asked the tone of mock surprise. She refused — and used what has become a standard courtroom strategy in child abduction cases in Japan: my son, she said, didn’t want to speak to his father, and she “should respect his wishes” and “shouldn’t force him to do things he doesn’t want to do”…. and by the way, did I remember how I held him too tightly with an arm about a year ago when he didn’t want to brush his teeth at bedtime?? Etc. This is her wall, her angle of offense, to pretend she is protecting him somehow, a macabre allegation that I’m harmful in some way to my little boy (a hideous fabrication and the metric opposite of truth), and to incite Rui to go along with her story — because it works in Japan, where so many hundreds, thousands of daddies have been roped and brought down with this lasso. Japan has a shockingly inhumane family court system that hasn’t discovered 20th century standards of decency, with virtually no law or powers protecting children and parents. The concept of joint custody doesn’t even exist in Japanese practice of law. The only course available to courts to follow is to award sole parental rights to ONE parent, which in 100% of the cases is the Japanese parent, and almost always the mother. Fathers, both Japanese and non-Japanese, are literally deleted from the child’s family history, the Koseki, the Japanese family registry. After divorce is rubber-stamped by a government official, imposition of one parent’s right of possession is imposed. “Finders keepers, losers weepers” as Jeremy Morley has written. Fathers are no longer legally related to their own children. If the mother is vicious enough to carry out the full identity violence on children allowed by this system and make use of the tools of emotional abuse available to her, the children’s names can be changed, children can be adopted by new “parents” or kept by grandparents, and the child’s real father, though guiltless, will have no say. Are you ill yet, reading this? Courts and government offices don’t even have to inform the child’s real father that this is being done, because as a father under Japanese law, he no longer exists. 5 years of love and care together, the core of a child’s experience, erased by a bureaucrat who just wants to think he is doing his job. It’s medieval, but also reminiscent of Stalinism. The fundamental perception of reality is defined and re-defined by the State in the face of obvious facts. And the State? The State is mad. You are a child’s parent. You are not a child’s parent. You are; then you are not. Friends and victims may already know all about all of this; it’s just the only way I have of expressing what I’m in the process of discovering, and of telling how urgent and dire the situation is. 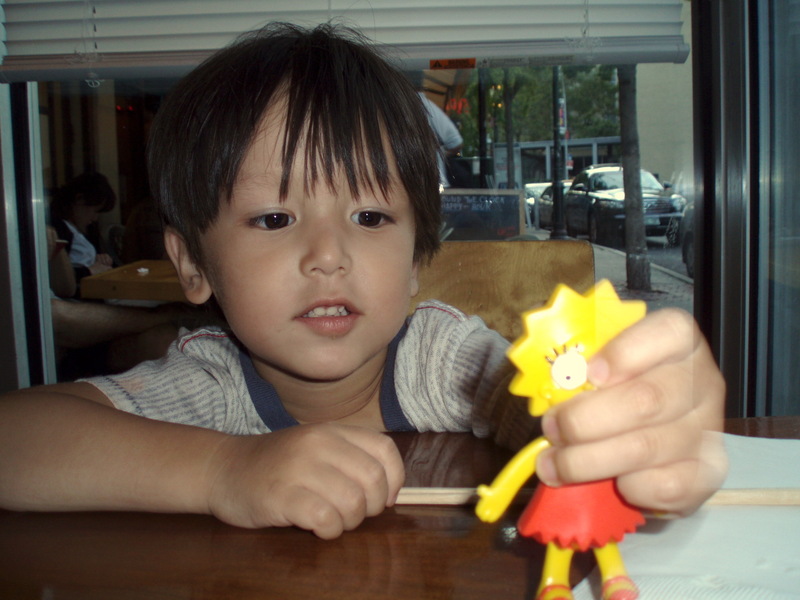 My son should be a Nice Little Jewish Boy in New York with a smiling Japanese mama and a Daddy who adores him, dotes on him, and can seldom be convinced to go out (a mystery to friends) so that he can be close to his tyke every rare spare minute. But instead, Rui is … … an abduction victim at age 5. Abduction victim. I can’t bring myself to these words without feeling lead-booted and nauseous. The ugliness, drag and gravity of it. This dream is intolerably vivid. Like I’m watching a film: the miserable Nazis have rolled in to gather the innocent for deportation and slaughter. We know we’re going to lose them, and we have to watch. How can this story of abduction be part of my life, associated with the brightest, most curious, sweetest boy? Rui was bound for life as a charmer. Shop girls would say to him when he was too young to understand that he should “be nice to girls” because his charm and natural good looks were too dangerous. People wanted to talk to and about him wherever we went. I never felt so astonishingly shined and polished than when I was on the street in New York with him. I smiled like a cartoon and carried him, as if we were the two most enchanting sights in the city. I dreamed street-walking crowds just as impressed with and sweetened by him as me. His last days of babyhood and pre-school family bonding have been and are now lived with conniving and lies being told all around him about his heart-broken Daddy. His Japanese family satisfies itself by possessing him like Saturn eating his young. They act to see his love destroyed. Rui suffers the consequences, plays his scene in their Ur-drama. They draw the curtain around him, hide him from himself, smother him in a dark family myth, a fool story. My life changed the day I met Machico Terauchi, but I couldn’t grasp it. Her appearance of outer good humor and kindness were deep cover, especially to herself. Once her inner adversaries were activated (scary, untrustworthy men, like the father she remembers), there was no cure, no matter who I was. She leaves this swath of damage behind her to live with. Harper: And then get up. And walk around. Let’s all hope that something can be done and that the damage can be held to a minimum. I don’t suppose there is much political benefit to be gained for politicians in coming down hard on Japan, but maybe that will change as well. I know all to well what it is like to call and have your ex say that the children don’t want to speak. I travel to Japan twice a year to see my children. Even after travelling all the way from Dublin to Tokyo I still get told that they dont want to speak to me. They have even been taught to say it to my face. I had a great relationship with my children before they were taken to Japan 3 years ago. They have been taught that I dont love them, that I am a violent man and that I am a thief. None of which are true. You must stay mentally and physically strong and keep trying to make contact with Rui in any way you can. One day he will need your love. At least thats what I tell myself so that I can keep going.